2017 is upon us, in case you forgot or don't use calendars or common sense. 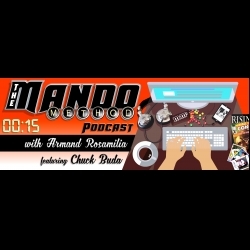 The Mando Method Podcast co-hosts Armand Rosamilia and Chuck Buda reassess some of the things that worked and didn't work in 2016 and map out a loose game plan for tackling the coming year as writers. We'll see what happens. Erin Al-Mehairi chats about the dozen ideas that will hopefully make your marketing strategies pop for you in the coming year in her Marketing Morsels segment. A nice list of items to help you out. Then everyone eats black-eyes peas for good luck and watch Chuck drink moonshine, which might be bad luck for him.